So after a fun day having the van shut down about 1000 feet from the mechanic, who thankfully came and dragged it in the rest of the way for me, I have an update on the van situation. Those who were helping me in another thread may recall I had 2 issues, the engine and something making disturbing noise underneath. The engine was fixed with a combination of issues, fortunately none major. The positive cable on the battery was lose, so this helped with the battery not charging. It wouldnt start because the pcv valve was bad, in combination with the other stuff. I had them do a tune up...it needed one badly. 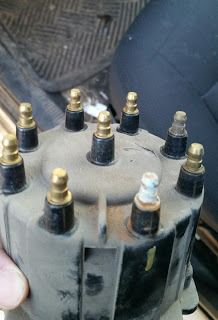 While doing it, they found the distributer in bad shape, and even more shocking, one of the plug cables was not even plugged in at the spark plug end. Just dangling. All that fixed, the van started and ran much like it did before my break down, though the check engine light is still on. I checked it, and it seems to be an ect sensor, engine coolant temp. Ill have him check that out. Now for the bad news. The noise underneath wasn't mounts or universal joints as was suspected (hoped? ), but it is something in the rear end. I could see 3 mechanics faces go to the same kind of face you get when you hear the person in front of you had a relative die. I knew I was in trouble at that moment. He said he will have to take it apart and maybe it wont be an expensive solution, but it might. Either way he didn't have the time to do that kind of thing today. I am bartering a business sign for the work he is doing. Im guessing the fact he brought up expense means that at least one of the problems may be so expensive he doesn't feel its worth it, so lets hope its one of the smaller easier fixes.